This post is a supplement to the “church discipline process” document/training posted earlier. The goal of this series is to equip churches to conduct church discipline with restorative excellence. You want to start an awkward conversation as redemptively as possible. The crisis or strain prompting discipline often results in the individual under discipline not responding to phone calls or emails. Let’s consider each of these before providing a series of scripts for reaching out when there are various levels of resistance. 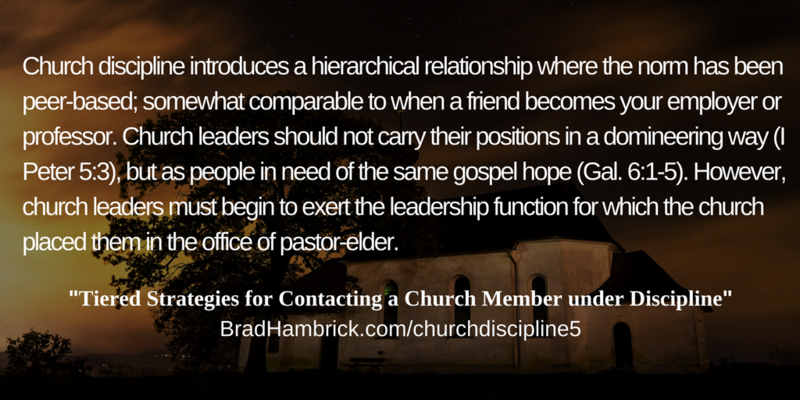 First, church discipline introduces a hierarchical relationship where the norm has been peer-based; somewhat comparable to when a friend becomes your employer or professor. Church leaders should not carry their positions in a domineering way (I Peter 5:3), but as people in need of the same gospel hope (Gal. 6:1-5). During church discipline, however, church leaders must begin to exert the leadership function for which the church placed them in the office of pastor-elder. They should acknowledge and be sympathetic to the effect of this change without apologizing for it or shrinking back from the roles which God assigned to church leaders. For this reason, the scripts below are progressive; inviting the church member to voluntarily engage with the discipline process before exercising the authority of our role and insisting that either difficult conversations be engaged or church membership will be revoked as a warning about their moral-spiritual condition. Second, church discipline is either prompted by a crisis or prolonged strain. Either way our friend may not view our best intentions as friendly. We do not want to hide our agenda; nor do we want to ambush our friend. However, not to address the chronic, moral struggle of our friend would be unloving. While there are four tiers to the outline below, this is not meant to imply there should only be four attempts at contact. Each tier is meant to represent a level of “intrusiveness” and “directness” (for lack of better words) in our communication. The approach below assumes that the church member is no longer attending church or small group when the elder would see them in the natural rhythms of life. Obviously, in-person conversation would be better than a phone call. If in-person meeting is available, then the tone and guidance in the scripts below can still be helpful in thinking through how to begin these conversations. The initial appeal to the friend would be on the basis of the shared relationship and genuine concern. Our friend is not only sinning, but undoubtedly, also hurting. We want to appeal to the pain as a reason to allow us to address the sin. At any stage in the process, if your friend is willing to talk, the early structure of the church disciplines process document contains the type and tone of conversation you are seeking to have. The presupposition of this church discipline series is that the concerns raised have enough validity that conversations would be of a highly purposeful nature. If appeals to relationship are ignored, then the leadership role of a pastor-elder requires that the church leader be more assertive in their request for conversation. When a church member is ensnared in chronic moral failure, a church leader cannot “do nothing.” The script below bridges from an appeal-to-relationship to a more direct request to address the problem. Foreshadowing an unannounced visit to the member’s home is not meant to be foreboding, but to prompt the member to realize that non-engagement on this issue is a non-option. Our desire is to have the church member respond so we can begin the next conversation with “thank you.” But if they remain silent, then this component of the message helps the unannounced visit feel less like an ambush. Unfortunately, church discipline sometimes requires an unannounced visit to a wayward church member’s home because the individual is unresponsive to a request to meet. When this is necessary, it is important to have more than one elder, and possibly other Christian friends, present. Having more than one person present in this meeting is in keeping with Matthew 18 and provides protection against any false allegations made by someone resistant to addressing their sin. This meeting would follow many of the same principles as staging an intervention (www.bradhambrick.com/intervention) for an addiction, but unless substance abuse is the reason for discipline, the concluding request would be participating in the discipline process rather than committing to attend a rehab facility. A model for the conversations and arrangement for this type of meeting is outlined in the intervention link above. When this mode of communication is needed, it is because other forms of communication have been ineffective – phone calls not returned, no reply to emails, and even attempts for an unannounced visit have been unfruitful. This communication is intentionally in writing so that its receipt can be verified; either being sent certified mail or as an email with the verify receipt function active. This communication is written in the first person plural (i.e., “we” or “us”) because it is written on behalf of the church as a whole. As we have indicated in previous communications, we have reason to believe that [summary of sin pattern]. Our desire has been to talk with you to verify if this is true and, if so, work towards restoration. Your continued non-response leads us to believe these concerns are valid. Our primary concerns are: (a) the well-being of your soul and (b) the reputation of Christ in our community. For both of these concerns we believe it is necessary, unless you choose to engage with a restorative process, to remove you from church membership. To you, this should serve as warning to examine your life and determine if you are submitting to the Lordship of Christ as you pledged to do when you were saved and when you joined our church. “We are sorry to have to announce that the elders are asking that we remove [name] from church membership. On [date] it came to our attention that he/she was [brief description of sin]. Over the last [duration of time], [name of elders] have made [number] of attempts to reach out to [name] in person, by phone, and via email. [Sentence describing whether there was engagement towards change.] [Sentence about indicators that change was no longer being engaged.] As a church we do not remove people from membership because we dislike them. We remove people from membership because we love them and want to warn them about the implications for forsaking Christ in the pursuit of sin. We do not like having to communicate information of this weight via written text instead of verbal conversation. But we are choosing to use the mode of communication that you have made available to us because we believe the content of the message is too weighty to go unsaid. Our prayer, even now, is that you would reach out to us before [date of member’s meeting] so that we could engage a restorative process. We love you and continue to pray for you. This is the unpleasant role of being a church leader. It is right to grieve when this type communication is needed. However, it is hoped that the process outlined in the church discipline process document and these guidelines, allows pastors-elder to arrive at this conclusion (when needed) without a sense of guilt; knowing that clear and effective opportunities to forsake sin and pursue Christ were given with enough support that the results would have been sufficient for a genuine believer.